Garlic and Sriracha are two ingredients that produce amazing results when it comes to chicken, just like this delicious, moist and juicy oven baked Garlic Sriracha Chicken. This chicken is packed with so much flavors: garlicky, spicy, sweet and savory I assure you it will be an instant hit. This chicken recipe takes an active time of practically 10 minutes and the rest is marinade time and oven baking time. For the best results, use boneless and skinless chicken thighs but you can certainly use chicken breast or even chicken drumsticks. To get the nice char on the chicken, broil it in the oven. All oven has a different broil function so make sure you don’t burn it. I usually just sit in front of my oven watching the food when I use the broiling function. Slice up the chicken into pieces like the photos. 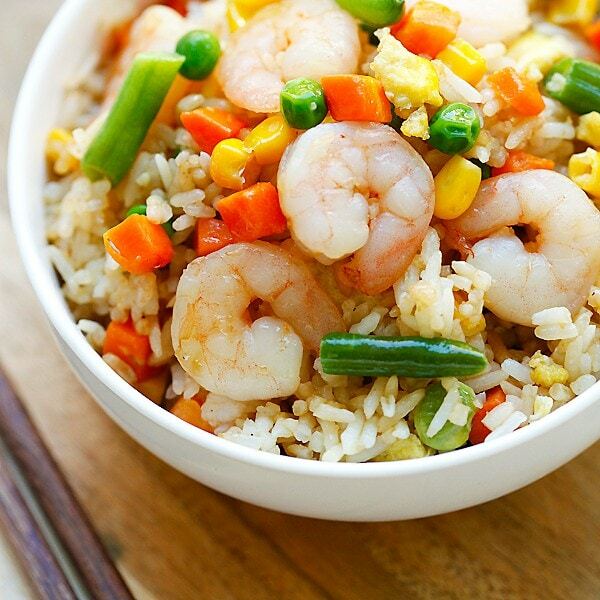 Serve them with steamed rice or noodles. 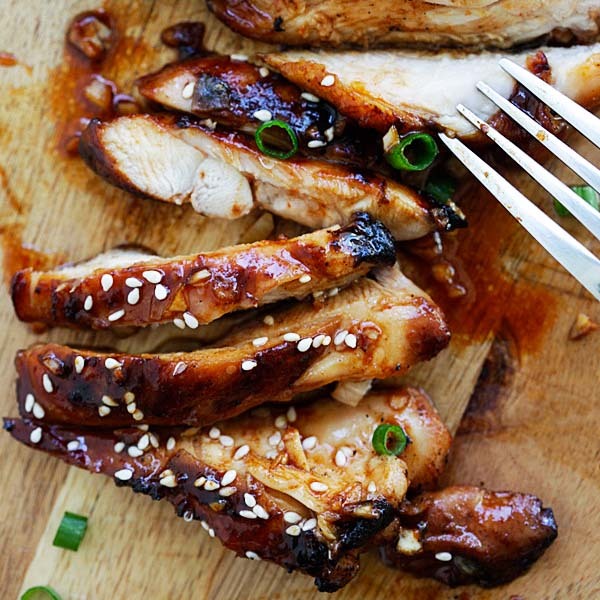 This Asian-flavored chicken is crazy delicious. Make it for dinner tonight! Garlic Sriracha Chicken - the juiciest oven baked chicken recipe with a mouthwatering Garlic Sriracha marinade. So delicious! Rinse the chicken thighs with water. Pat try with paper towels. Mix all the ingredients in the Marinade. Stir to combine well. Combine the chicken thighs with the Marinade and marinate for 15 minutes. Transfer the chicken and all the garlic Sriracha marinade to a baking sheet lined with parchment paper or aluminum foil. Cover the chicken with aluminum foil to prevent burning. Bake the chicken for 20 minutes, or until cooked. Remove the foil, spoon the dripping over the chicken and broil the chicken for 1 minute to char the surface of the chicken. 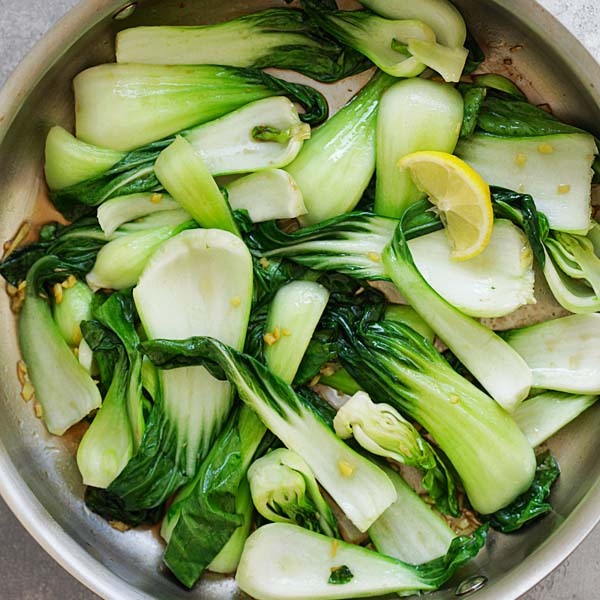 Remove from heat, sliced into pieces, garnish with the white sesame, scallions and serve immediately. All photos and recipes on Rasa Malaysia are copyright protected. Please do not use the photos and recipes without prior written permission. If you wish to republish this recipe, please rewrite the recipe in your own words instead of copy and paste and link back to //rasamalaysia.com/garlic-sriracha-chicken/. Thank you very much! Are you sure the calorie and fat numbers are correct? Would the numbers be slashed by using chicken breasts? haha… I figured a typo bc it wasn’t computing? I made last night using chicken breasts and deelish…. making another batch tonite as i love it cold sliced on chopped salad or w the tabouleh!!! you have awesome recipes! A new family favorite. We made this tonight and loved it. OMG, you are too fast. I am so happy that you made this garlic sriracha chicken! I will definitely be making these with some form of chicken soon! What I like most about your recipes is they always include stuff I have on hand, which is also my favorite stuff! Hi Denise thanks for your sweet comment. I try to make my recipes accessible. This Garlic Sriracha chicken is yummy! Can this chicken recipe be marinated overnight. I made this tonight and it was delicious! I will be making it again. After broiling my chicken still did not have the dark charred look and was much lighte in color so I’m wondering if I should have pored more marinade over it before baking…. Hi Carmen, yes, pour all the marinate over the chicken before baking. And depending on the broil function, you might need to broil longer. Thanks for trying the garlic Sriracha chicken recipe. Made this as directed and loved it! YUM YUM and easy too! Hi Denise so happy that you got to try this garlic sriracha chicken recipe. I’m making this tonight and will let it marinate overnight. Doing separately chicken and shrimp, YUM! My prep work for next week’s lunches and dinners. Can’t wait! Sounds yummy. Thanks for trying my garlic sriracha chicken recipe. Thank you for this recipe it looks delicious. Iam going to purchase some Sriracha today so I can make it. What veg would you recommend to serve with it?? This could have been an even better recipe in my humble opinion if it had been suggested, to heat the left-over marinade to a boil, and pour on top when serving. Has a very nice taste! Hi Frank, I used all my marinade when baking the chicken, so you don’t have to boil. I would like to know if you think this can be made in the crockpot. I know I would not get that nice, dark char on the outside but the flavor would still be the same. Wondering if you made extra marinade for your photo of chicken in dish as the small amount of liquid called for in recipe, not much more than 1/4 cup couldn’t possibly fill that dish as high as it looks. Lovely sounding recipe though, like the ease of bringing it together and the fact I have everything on hand to make. I think I’ll follow my wonderment though and make extra marinade just in case. Hi Joycelyn, what you see is exactly per the recipe. I didn’t use more or less. 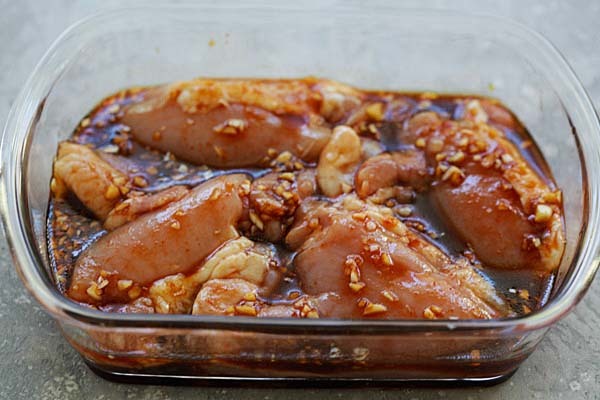 Remember when you add chicken to the marinade, the moisture of the chicken comes out too. Greetings from Penang! Made this recipe last night. Unbelievably delicious. Will certainly be making this often. So easy too! Looks so yummy! 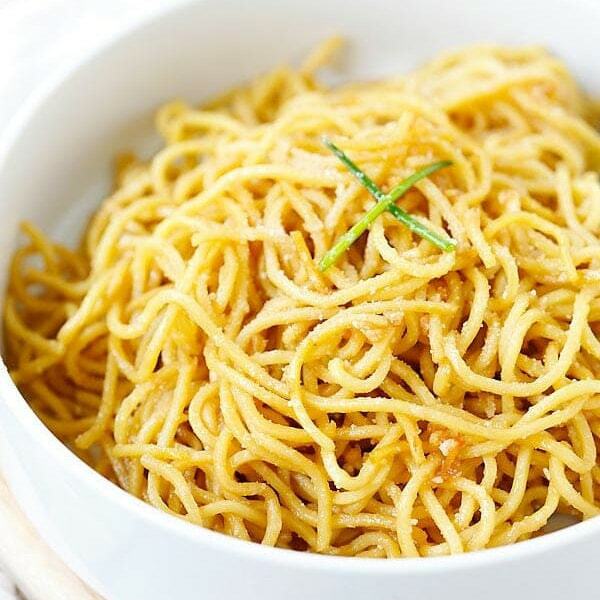 Wanted to make this tonight but not sure if this dish would be too spicy or not. I love a kick but one of the persons eating is sensitive to spice. It’s not really that spicy, you can cut down on the Sriracha if you don’t want too spicy. Great flavor, but I couldn’t get the chicken to brown like what is shown in the photo. Wonder what I did wrong? Hi Lisa, thanks for trying my garlic sriracha chicken. Did you broil the chicken? Do you have skin on? The brown color is also because of the dripping. Did you use the dripping on the chicken? I am doubtful that ½ lbs of chicken thighs would only be 117 calories. You say that 2 lbs of thighs, with dripping, divided four ways, comes to 117 calories? 5 ounces of plain chicken breasts are 198 ounces, according to my Lose It website. And that is less than half a lb., and breasts have fewer calories than thighs. What am I missing? This was delicious but looked nothing like the picture. The marinade was thick going in the oven and came out very watery. The chicken was a nice brown color, I broiled for 6 minutes, but didn’t have that charred look to it. Next time, I may move the pan closer to the broiler, or just use a cast iron pan on the stovetop! Flavor was great, served with jasmine rice and broccoli! I was just looking for a simple little dish for tonight’s dinner. But this recipe blew me away: it tastes fabulous!!! And for once I actually stuck to a recipe. As I was cooking for one I did however double the marinade. I served it with fried veggies and cabbage which made for a very healthy and super tasty dinner. This is going on my “go-to” list. Hi Afra, that’s great that you tried my garlic Sriracha chicken recipe and love it.